Other provinces and territories had estimates too small to report. Source: CICH graphic created using data adapted from Werk CM, Xinjie C and Tough S. Fetal alcohol spectrum disorder among Aboriginal children under six years of age and living off reserve. First Peoples Child & Family Review. Voume 8, Number 1, 2013 using data from Statistics Canada 2006 Aboriginal Children’s Survey. 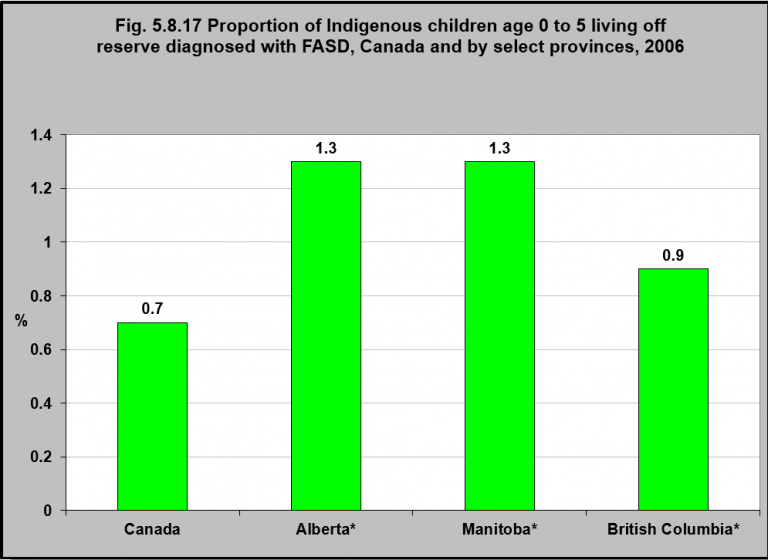 According to data from the 2006 Aboriginal Children’s Survey, the proportion of Aboriginal children under 6, living off reserve, who were diagnosed with Fetal Alcohol Spectrum Disorder (FASD**) was 0.7%. That proportion varied between provinces – it was 1.3% in Alberta and Manitoba and 0.9% in British Columbia. 1Werk CM, Xinjie C and Tough S. Fetal alcohol spectrum disorder among Aboriginal children under six years of age and living off reserve.First Peoples Child & Family Review. Voume 8, Number 1, 2013 using data from Statistics Canada 2006 Aboriginal Children’s Survey. 2Public Health Agency of Canada. Fetal Alchol Spectrum Disorder. http://www.phac-aspc.gc.ca/hp-ps/dca-dea/prog-ini/fasd-etcaf/index-eng.php-accessed July 29, 2017. 4The full spectrum of effects associated with inutero exposure to alcohol are commonly referred to as fetal alcohol spectrum disorders (FASD). 5Tait, C.L. (2003). Fetal alcohol syndrome among Aboriginal people in Canada: Review and analysis of the intergenerational links to residential schools. Ottawa, ON: Aboriginal Healing Foundation. 6Indian Friendship Centres. (2013). Fetal alcohol spectrum disorder: A position paper. Toronto, ON: Author, p. 4.